More than 17,000 Germans took part in protests against "Islamisation of the West." Down through history, the German city of Dresden has endured a great deal. When I was in school, I remember learning about the allied fire bombings of Dresden during World War II. Yes, the German people have proven themselves to be extremely resilient. And yes, especially the people in Dresden who have persevered through a great deal of hardship. They can take pride in knowing that they have always came back from adversity stronger than before. Right now, many people in Germany have lost patients when it comes to the current wave of Muslim invaders. The people in the German city of Dresden in particular are fed up with Islam being forced upon them by their government. Chancellor Angela Merkel "warned" Germans not to be exploited by extremists saying, "There's freedom of assembly in Germany, but there's no place for incitement and lies about people who come to us from other countries." Mrs. Merkel also said, "Everyone needs to be careful that they are not taken advantage of by the people who organize such events." Clutching German flags, candles and banners, thousands of Germans joined the demonstration. "No Sharia Law in Europe!" proclaimed one banner. The government wants people to think that it is not about the people's dislike of Sharia Law, that it has to do with some sort of racism. Yes, as if taking a page out of President Obama's playbook where everything can be blamed on racism. Fact is most are protesting against high levels of immigration and asylum seekers, many of whom are getting government benefits and taking jobs from German residents. Many see the Merkel government as capitulating to the wishes of Muslims and their desire to instill Sharia Law into German society. During the march, protesters chanted "Wir Sind Das Volk" ("We Are The People")! This has been a rallying cry to remind the German government that they are not run by a Dictatorship and that they have a voice in what takes place there. This same rallying cry was used in the city in the weeks before the fall of the Berlin Wall 25 years ago. One elderly man shouted, "I'm a pensioner. I only get a small pension but I have to pay for all these people (asylum seekers). No one asked me!" The BBC, which as everyone knows has been pro-Muslim in Great Britain, covered the protests. And no, according to my readers in Germany, the BBC did not see the protests the same way the German people had. One of my readers wrote saying that the BBC painted the protesters there as Nazi and depicted the Muslims as 1930s Jews. PEGIDA is a new group, having just established in October after it was announced that 14 Muslim refugee centers were set to be created in Dresden. Those 14 Muslim refugee centers would house 2,000 immigrants and asylum-seekers who were fleeing from the Middle East. Of course the group PEGIDA opposed the plan, and was instantly dubbed by the Merkel government as "far-right extremists" and "Neo-Nazis" in an effort to discredit their opinions and make them appear to be as extreme as the Muslims who they oppose. A woman who traveled 50 miles for the demonstration told the BBC, "I am not right wing, I'm not a Nazi. I am just worried for my country, for my granddaughter." Justice Minister Heiko Maas called the protests "a disgrace." In contrast, Bernd Lucke, leader of the AfD, said, "Most of their demands are legitimate." Mr Lucke has campaigned for a tougher policy on immigration, as well as rejection of the Euro. Bias in the news does not only apply to the United States as reports tried to say that such protest scenes would have been inconceivable in Germany just a few years ago. They try to depict many in Germany as "ashamed and horrified" not just by the numbers at this demonstration but by support for right wing groups elsewhere. One factor screws up the bias reporting, and is making an impact on politicians there. That factor is that the vast majority of the crowd in Dresden are not extremists or neo-Nazis -- but ordinary everyday hardworking citizens. Conservative politician Wolfgang Bosbach said, "these are concerned mothers, pensioners." The sheer numbers at recent demonstrations are forcing a public discussion about immigration there. And yes, it’s a debate which many say can no longer be ignored. Immigration has become a hot topic in Germany this year, amid a surge in the numbers of asylum seekers, fueled by the wars in Syria and Iraq, are flooding into that nation. Germany takes in more Muslim asylum seekers than any other European country. Germany expects 200,000 Muslims to seek asylum claims for 2014, up from 127,000 in 2013. This massive grassroots demonstration in Germany was started to stop the Muslim invasion of Europe. It should be noted that between the protesters chants of "Germany is not a land of immigration” and "We are the People" which echoed through the crowed, the protesters sang Christian Christmas carols. While the government might have gotten the message, Muslim attacks on Christian symbols are taking place as they have been. The latest took place on December 26th, yes just 3 days after the demonstrations in Dresden Germany. A Muslim man cut down 60-yr-old cross because it offended him and his Islam belief. It's true, a Muslim man cut down a sixty-year-old seven-foot crucifix because it offended him. The cross stood for 60 years in a small town in Austria. It was erected after WWII and was a main reference for the entire village. The Muslim man moved there from Egypt and from the time he arrived he hated the cross being there. Besides the Muslim man cutting down the historic cross, he damaged the base of the cross and the knees of Christ when it fell. The mayor has called the act of vandalism “radical”, “offensive”, and “inflammatory”. The local branch of the ruling Christian Conservative party has reported the act to police and made an official complaint. People there hope the Muslim man gets arrested and is deported back to the animal kingdom where he came from. As for the protesters in Dresden, no one burned down a single business in comparison to what took place with the animals if Ferguson Missouri! Yes, I did call the looters, rioters, arsonists, and thieves -- animals. After all, they are that. And no, I wouldn't refer to them as animals if they had held a protest to protest -- instead of holding a protest as an excuse to sack their city, burn down businesses, and put a lot of middle class working folks out of jobs. Yes, that's who their actions hurt the most. So let's compare the more than 17,000 truly peaceful protesters gathered in the Dresden City Center as a show of solidarity against "Islamitization" in their country to the animals in Ferguson Missouri. 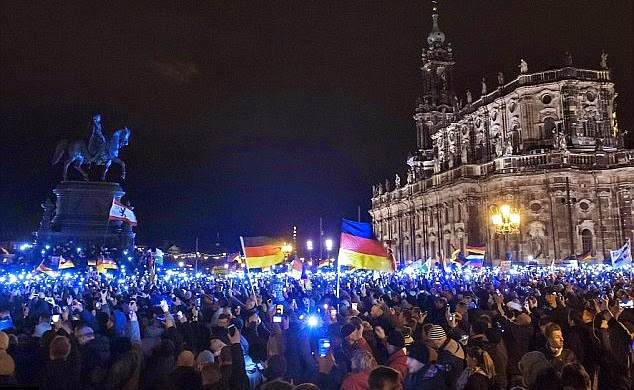 The demonstrators in Dresden Germany exemplify the true meaning of what a "peaceful protest" should be -- and their keeping it peaceful is extremely commendable. Ever wonder what sort of people burn down their own town? They are the same folks who have the nerve to say either rebuild or we're riot even more. It's true, believe it or not, in Ferguson, the animals who burned down their town are now threatening to do it again if the 56 businesses they burnt down don't rebuild. Some of the big businesses have pulled out of the area, and no telling how many more will refuse to rebuild in that jungle they call Ferguson. I tip my hat to the folks in Dresden, Germany. Their power is in the way they organized and made their opposition known. If they capitalize on this through imposing political pressure on those in office, then yes I believe that they can push Islamitization out of Germany -- or at least stop its progress. I can only hope this anti-Islamitization movement spreads from country to country all over Europe. I hope that both Christians and Jews will join together to take a stand against the Muslim threat and Sharia Law which Muslims want to impose upon those countries.. Yes, I hope it happens soon. If the encroachment of Islam is not stopped peacefully, I'm afraid violence will follow soon enough.